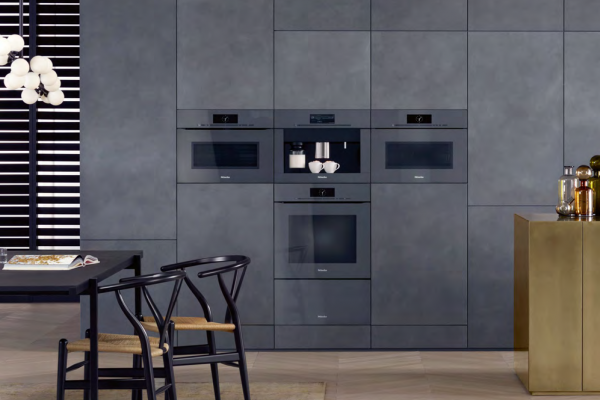 Where kitchens and living rooms merge, a clear design statement is needed – and Miele addresses this with its new ArtLine series of built-in appliances. 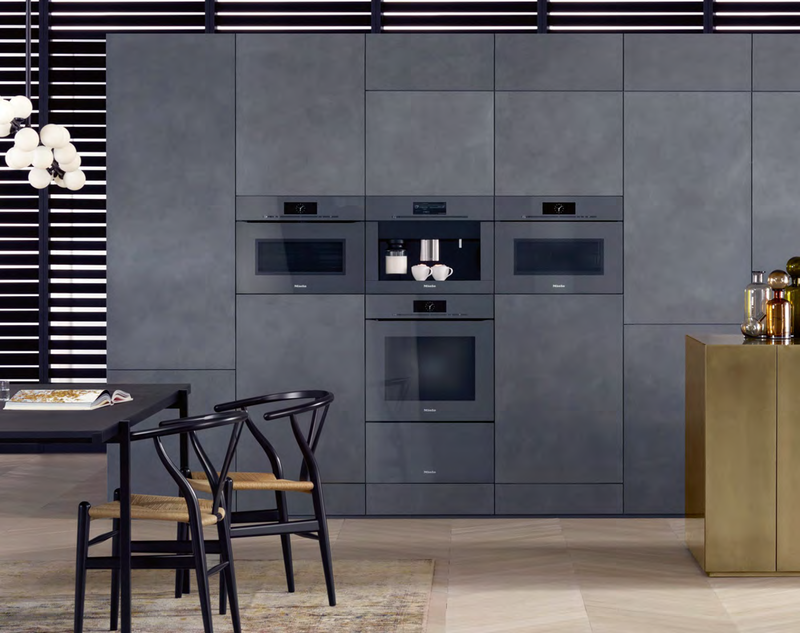 The entire collection dispenses with handles, blends in seamlessly with the flush furniture fronts and interprets the concept of full appliance integration in a whole new way – optionally in graphite grey, brilliant white or obsidian black. ArtLine design encompasses a variety of products and allows entire kitchens to be designed without a single handle. 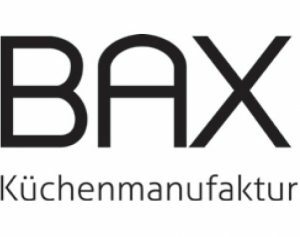 The portfolio includes various ovens, hob units, warmer and heat-sealing drawers, a coffee machine, a wine conditioning unit, refrigeration products as well as dishwashers – all handleless versions from the Miele range. Cooker hood models which disappear behind furniture fronts when switched off round off the line-up. 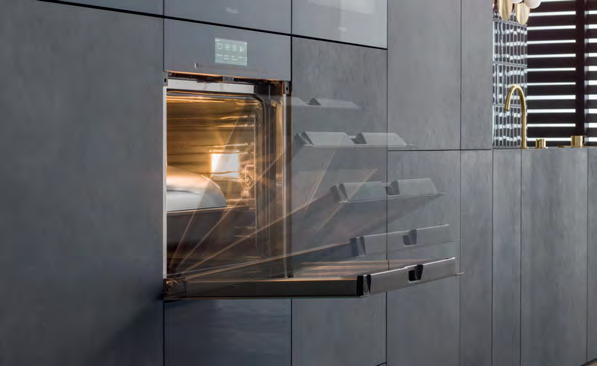 Miele customers can design their kitchens around their own preferences. ArtLine models are based on current built-in appliances from Miele’s Generation 6000 – with one significant difference. motor-assisted door, damping its action as it reaches the fully open position. An oven can hardly be started with greater effect! Customers can choose between two ArtLine models: Price-entry models feature Miele’s DirectSensor controls whilst top-of-the-range offerings boast an M Touch display which is reminiscent of a smartphone in the way it interacts with its user and also offers a practical search function for automatic programmes. Both versions are without knobs and controls. A brief note with a big thank you – I am absolutely delighted with my kitchen. In the design, Alex fulfilled my brief completely. A big thank you to him. As for your workmen – they were a dream! Pleasant, efficient, thoughtful and a joy to have around. Quite the best I have ever experienced. Excellent. I am so pleased, thanks to you all. The installers cared so much to work around our difficult timetable. Everything went well. Three months and I still LOVE my kitchen! As it did the first day it was finished. Excellent workmanship and scheduling. Staff all working to a high standard and very pleasant. The design process went smoothly and Alex gave good advice and always answered questions. Everyone was very easy to deal with, especially Alex who was extremely helpful and knowledgeable! The whole experience was made to be painless! Everything exceeded our expectations. A well-coordinated team of professional tradesmen who worked with consideration and courtesy. Many thanks. © Kitchensmiths Ltd 2019. All Rights Reserved.